Powers/Abilities: The Glob’s body is composed of a slightly unstable "mud"-like matter. He can excrete similar slime-like material from his body, which he uses to smother living beings. As he used a derivative of Ted Sallis’s flawed Super-Soldier Formula, it is possible that he could regenerate body parts in the same manner Sallis (as Man-Thing) could, but no such evidence was presented during his appearances. Height: (Beckwith) 5' &"; (Glob) 6' 6"
Weight: (Beckwith) 192 lbs. ; (Glob) 900 lbs. History: (Incredible Hulk II#389 (fb)) - The Pantheon hired Beckwith to head their medical research center in Florida. Needing seclusion due to the danger of the toxic chemicals he was going to use in genetic experiments in an attempt to cure cancer, Beckwith worked alone in the Everglades. 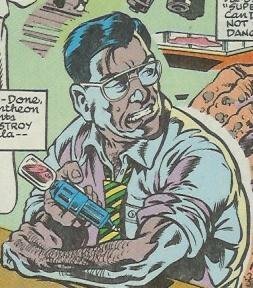 While there, he discovered Ted Sallis’s old research journals, and traveled to Sallis’s old laboratory. Upon recreating the flawed Super-Soldier Formula that Sallis had created, Beckwith decided to test it upon himself. Soon after, he began mutating into something different. 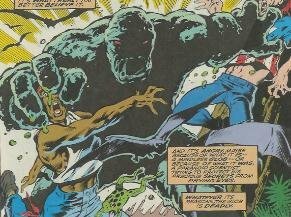 (Incredible Hulk I#389) - Roughly a year later, Paris, a member of the Pantheon, realized the possible connection between a rash of murders by a "swamp monsters" in the Everglades and the disappearance of Beckwith. He sent the Hulk and Rick Jones down to investigate. There, Jones encountered a group of thrill-seeking kids who knocked him unconscious and tied him up to a tree in order to draw out the Man-Thing. However, the Man-Thing was not the first to arrive, but rather Beckwith, now a mud-monster, was, bringing along two dead bodies of the kids who ran across him earlier. Beckwith/Glob attempted to smother Jones, but was pushed away by the real Man-Thing, who sensed Rick’s fear. However, before the Man-Thing could touch Jones, the Hulk arrived on the scene, distracting both monsters. He then fought with the Glob and began hurting the creature so much that it began to feel fear. Driven by the emotion, the Man-Thing grabbed the Glob, and Beckwith burst into flames, reduced to a pile of ash and mud. Comments: Created by Tom Field, Gary Barker, and Mark Farmer. This was a fill-in issue during Peter David’s long run on the book, and it shows. First, the Glob’s real name: At the beginning, Paris refers to him as Sumner Beckwith. However, after he dies, the narration refers to him as Dr. Samuel Beckwith. Since this is a Hulk comic, I think it’s fitting that we see this in the David Robert Bruce Banner mold, and assume his name is a combination of the two. Secondly, there has only been a gap of one year between the time of Beckwith’s original project and the story. Yet, the Hulk confuses him with the original Glob, whom he fought many years before. How he can think this is the same creature, especially after he realizes it is Beckwith, is beyond me. And somehow, he manages to "recognize" the Glob, yet doesn’t recognize the real Man-Thing, whom he’s encountered before too. In fact, he encountered him at least once while encountering the Glob as well! The dates given in Beckwith’s journal of occurring in 1990 can be seen as topical, and should move along with Marvel’s sliding timescale. I’ve listed "Man-Thing" under other aliases, as he was mistaken for the real thing throughout the story.